While thinking about something to post today it occurred to me that I had a very long overdue post sitting in draft waiting for some photos. I found it odd that I’d forgotten about it for so long until I realised that when I upgraded to windows7 a few months ago I lost all my draft posts for Live Writer which is the program I use for blogging. I’ve done some detective work and have managed to find and finish the post! Elijah received lots of lovely gifts for his birthday. I always appreciate the time and effort people put into giving any gift, but I do have a soft spot for handmade. Meet Bunny Holly. Elijah may very well change his/her name when he is older, but for now we’ve named it after Holly of Two Cheese Please who made bunny for him. To say I was touched when I saw this gift is an understatement. The first inkling that Holly was going to make him something was when I received a message asking if Elijah has a favourite animal. 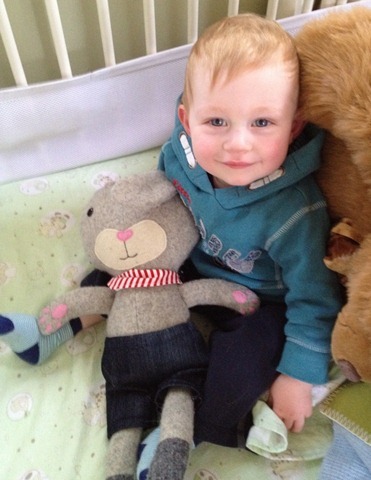 I replied with ‘rabbit’ because he was born in year of the rabbit and has a favourite rabbit softie. I was rather excited as I LOVE everything Holly makes (go and look at her blog!). Over the next week Holly teased her friends and followers with instagram pics of the bunny taking shape. When bunny finally arrived it was even better than I had imagined! Anyway, it’s probably time I stopped gushing and showed you some photos! Thank you, Holly. Bunny Holly will be a much loved gift for many years to come. What a cute little bunny! I have an old skirt in a grey mottled wool just like Bunny Holly’s fur that my scissors & I have been eyeing off for a project. 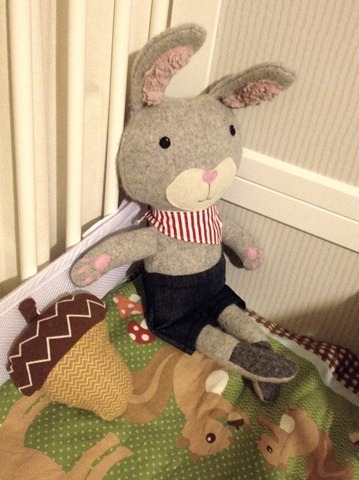 I might have a go at making a bunny for my little B.